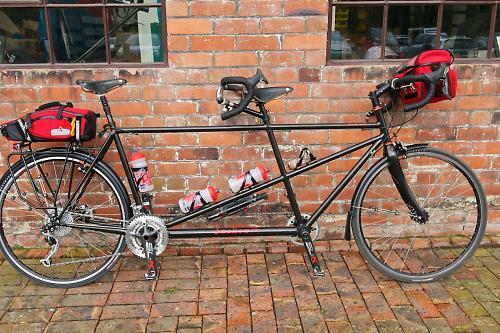 Riding a tandem requires a special bond between two cyclists. 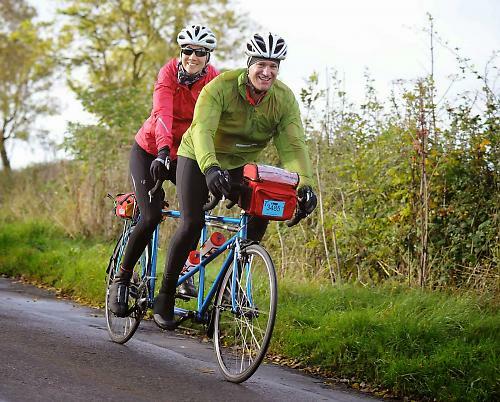 For Brian Buckle and his wife Kimberley, riding their renovated Swallow tandem adds an extra dimension as Swallow gave Brian his first job, making the tea when he was just 13 years old. In April 2013, my wife Kimberly booked a wee break in France with Dave & Sue Flitcroft. These two have a knack of converting everyday cyclists into tandem fanatics, and Kim and I were no different. The following month we bought Swallow SW228 from eBay in a bidding war that, as far as I was concerned, was only going to end one way. The timing was terrible, as I had to fly to USA the following day, causing me to wait a week before getting my hands on the blue bird. I landed early in the morning and stopped by Buckle Towers to pick up Joe before driving to the Welsh border to pick up the goods. I was really excited and hoped that my excitement wasn’t going to turn to sadness on arrival. After all, spending £500 on an old bike you have only seen a few pictures of can be risky. I had forgotten just how long a tandem is and had planned to fold the back seats down and call it good. It wasn’t that simple though. I had to remove the mudguards, both wheels, rear rack, the seat post, stoker stem and handle bar stem before I had any chance of fitting it in. Within a few minutes our new bike was a turning into a pile of bits on the roadside and the previous owner was staring at me like I was some kind of freak. The following day I rebuilt the bike and it was time to check out the finer details of this wonderful machine. First up was the frame number: SW228. My career in the cycle industry started when I was just 13. A crash on my road bike had left it damaged beyond repair. The insurance company needed proof and recommended I take the bike to Swallow Cycles, a place I had never even heard of. Peter Bird greeted me and after a moment of standing in bike shop wonderland, we started talking about whether I could make tea, sweep a floor, wear an apron and put tools back on the rack. A few minutes later I became the newest recruit at a bike shop five minutes from home, earning a whopping 95p an hour. Continuing to closely inspect the tandem, I realised that I had built the wheels on SW228. From that moment on, I fell in love with the old bird. From May to November, Kim and I rode our 18-speed, down-tube-shifter, V-braked antique just about anywhere we could. We rode sportives, work commutes, lunchtime rides and even our first century. We closed 2013 putting in some 1800km of tandeming, and I don’t think we had a single ride that we didn’t enjoy. Guess we were made for tandeming. Within a few days of owning our Swallow, I started researching every tandem component available from around the world and compiled a list as long as my arm. 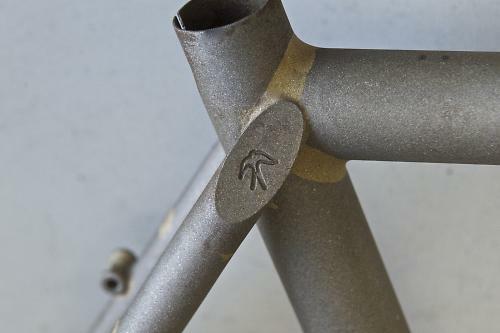 I got in touch with Pete Bird at what’s now Swallow Bespoke Bicycles to discuss renovating SW228 versus buying a new one. Pete pointed out that a renovated SW228 would be unique and a part of my history in a way no other bike in the world could offer. We were sold on the idea and started saving. Month-by-month the garage was filling up with new parts shipped in from all round the world, including Paul’s components brakes. Parts I dreamed of when I was teenager were soon going to take pride and place on the font of our bicycle made for two. In November, we took the tandem to Swallow (now located in the John Rose building in the industrial town of Telford) to discuss the finer details of bringing a 1988 tandem back to life, creating something special that we will own for a lifetime. Within a few minutes Pete had discovered some rust holes, and my face turned from joy to sadness in a heartbeat. Never one who can’t solve a problem, Pete took the bike into the frame building shop and set about a temporary repair to keep us on the road. I was now armed with a long list of modifications from minor additions like more water bottle bosses, to major changes including replacing the head tube and fork. In December I stripped off all the parts. I filled the dumpster with some worn out parts and listed some old classics on eBay to try and recover a few pennies to put towards our new bicycle. January 6 was the elected date to put the bird under the knife. Three weeks later I collected the frame and took it to Argos Racing Cycles to be painted. This wasn’t a planned day out but an essential one for me, as I had promised both Kimberly and myself that our new machine would be ready by Valentine’s Day. I wasn’t about to break that promise. One week later we were back in Telford, ready to bring our dream to life. The build took longer than I had planned, mainly because I don’t spend much time in the workshop anymore. Additionally, each component was assembled with a lot of TLC. SW228 now has new cable routing, new head tube and a disc brake mount and of course, new paint from Argos. Finally it was time to ride. There is something special about owning a new bike — and trust me I have owned many over the last 25 years — but this one isn’t like any other; it’s a piece of history that’s been hand crafted, hand painted and hand assembled by a small company that started in Essex, which gave me my first job and in turn, a lifetime friendship. Brian Buckle is now European Marketing Manager for Trek Bicycles. After his start as teaboy at Swallow, he joined Trek in 1996 as a sales rep, and the rest is history. Nice bike and story behind it. Absolutely charming story... hm i dont have a tandem yet...and no room in my pokey flat for one with my 5 other bikes...BUT I NOW WANT ONE!!! lol...now see what you've done...! I LIKE this story too. 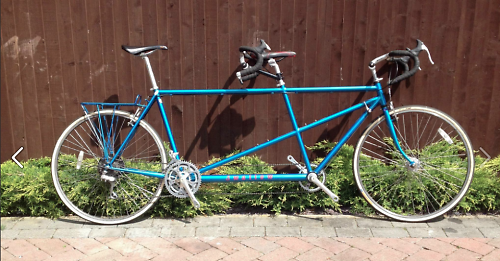 Sadly I only ever got to train and race on a (borrowed) tandem in several events back in the 1970s, despite later on almost pleading with my ever-loving that we should buy one. The details of building the machine up reminds me of Tim Moore's account of doing the same with a 1914 era single in his truly hilarious book 'Gironimo' so he could ride the whole route of the 1914 Giro, hence the need for a 'period' bike. Tim suffered much more angst in his refurbishment endeavours due to a false start with some dodgy kit, causing him to start all over again with a 1912 'Hirondelle.' The name is French for 'swallow' – is that a coincidence or what? On completion Tim took the single speed machine to Italy to ride the route of the 1914 Giro; an absolute monster of a race with average stage lengths of around 390 kilos. One of Tim’s many laugh-out-loud comments was that had Jesus Christ himself been obliged to ride the 340 k longest stage, Christians the world over would now be wearing tiny bicycles on chains round their necks rather than crucifixes. But I can't help but think that black is not the right frame colour in this case. JMO.